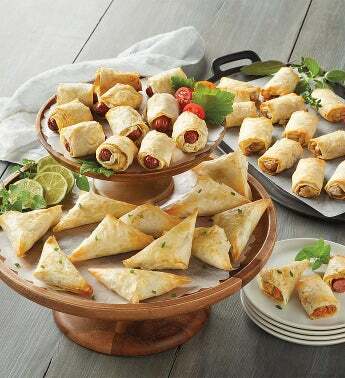 Entertain effortlessly with this gourmet trio of savory appetizers. Samosas are a popular Indian treat. Each crispy fillo triangle is filled with premium potatoes, onions, peas, corn, and carrots, as well as a sensational blend of Eastern spices. These are organic and vegan. Barbecued pulled pork rolls are a flavorful favorite, each flaky fillo roll is deliciously sweet, tangy, and smoky. Cocktail franks are a mouthwatering classic. Nitrate-free, all-beef franks are dressed in Dijon mustard and sauerkraut before being wrapped by hand into fillo rolls. Simply bake in the oven and serve to impress.